Bengaluru, June 12, 2018: Special investigation team (SIT) on Tuesday arrested a 26-year-old man who is suspected to have shot dead journalist Gauri Lankesh outside her home in Bengaluru in September last year. The accused, Parashuram Wagmore, is a member of the right-wing group Sri Rama Sene. He was produced before a magistrate and sent to police custody for 14 days. The SIT also arrested his alleged accomplice Sunil Agasara. According to police, Wagmore is from a small town, Sindagi, in Bijapura district in northern Karnataka and used to run a mobile phone shop there. Sunil irons clothes for a living in Sindagi. Although police refused to confirm, sources said Parashuram was one of the two persons present at the crime scene on September 5, 2017, when Lankesh was shot down in front of her house in a cold-blooded attack. Going by the descriptions of the features of the shooter in the case - as given by witnesses so far and the CCTV evidence on his height, weight and other characteristics - the SIT suspects that this short stocky man was the one who pulled the trigger on Lankesh. However, what his role was, was not mentioned by the Prosecutor while seeking his custody in court. The ten-minute hearing only had the SIT counsel seeking his custody for questioning. The magistrate asked Parashuram if he wants access to legal aid through the court - which he declined. To prepare the drawings that led to the arrest, the police had taken the help of one Anil Kumar of Srirangapatna, a friend of accused KT Naveen Kumar who has been chargesheeted for his role in providing logistics for the murder. Kumar had on Monday also reportedly confessed to the police that the murder plot was hatched by some leaders of a Hindutva outfit. Wagmore, police said, was also linked to Hindu right wing organisations earlier. In 2012, he was accused of hoisting Pakistan’s flag on the office of Sindagi’s revenue officer along wit six others to foment Hindu–Muslim tensions in the town. The next day he and his co-activists of the Sri Rama Sene had held protests outside the taluk office against the hoisting of such a flag and even tried to manhandle the district police superintendent. However, the police had quickly arrested the culprits, who were all linked to Hindutva organisations, they said. A local court had dismissed the case later. However, Wagmore’s friend Rakesh told News18 that he had nothing to do with the murder and had never even been to Bengaluru in the past. “We can’t believe that he is the real killer. Normally he used to be at Sindagi. If the police have any evidence, they should produce it before us,” he said. He claimed that Wagmore was actually picked up by the police three days ago. He even requested the Hindu society to rise against the government. Wagmore’s house was locked on Tuesday and his parents were not available for any comment. He told the court on Tuesday that he would hire a lawyer to defend him after the court offered to appoint a public defender. A few months ago, the SIT made its first arrest in the sensational case. 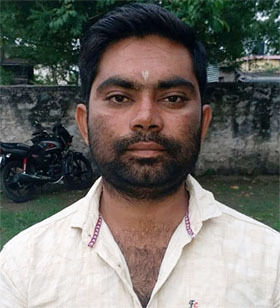 Kumar alias Hotte Manja, a Hindu right wing sympathizer, was taken into custody and his sustained interrogation led to the arrest of a few more persons for the murder of Lankesh.